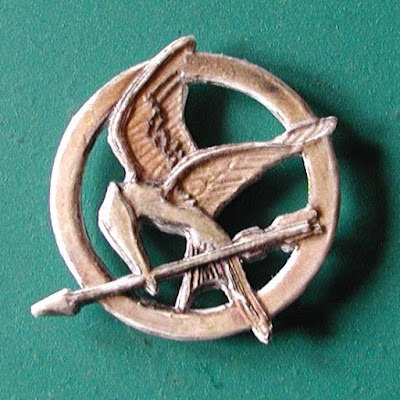 This papercraft mockingjay pin uses a construction technique I had never seen before. Layers of cardstock are glued flat on top of one another to create a sculptural effect. The end result, to my eye at least, is very close to the prop pins used in the Hunger Games movies. A free printable template for the pin may be downloaded from Steve's Paper. The pin in the photo was coated with super glue to strengthen the paper. According to Steve this final step makes the pin "surprisingly tough".